Deneum, a company aiming to revolutionize global energy industry with the nuclear fusion Power Station, announced that it has successfully proved the feasibility hypothesis via its laboratory unit during the private demonstration. Deneum also concluded $ 1M during the private round first stage. Offering global market the Philosopher’s stone of energy generation based on interaction between Titanium and Deuterium, Deneum has successfully concluded the first private demonstration of the Power Station laboratory unit. The demonstration held in Deneum R&D laboratory in Tallinn implied the Power Station launch and main operating mode showcase. All the indicators including temperature fluctuation, pressure, vacuum density and others were measured and visually represented online via the public proprietary software provided by independent vendor. “The main indicator of an appropriate interaction of the active body components within the Deneum Power Station is successful maintenance of a certain installation mode, in which amount of energy needed for launch, once consumed creates a thin level of resonance that implicates a self-sustaining reaction between titanium hydride and deuterium. This reaction is exothermic with a large amount of excess heat, which is then to some extent converted into electricity and partly used “as is” in the form of thermal energy. We were able to achieve and maintain this effect during the demonstration. This makes it 63 successful feasibility tests in a row with this one carefully measured and documented, – comments Dmitry Samoylovskikh, Deneum CEO & founder. – We’re witnessing the largest particle physics breakthrough of the century, and Deneum team is very glad to make it happen”. The reaction produced by the active body components is self-sustaining, which means Power Station keeps on working without any further intervention once launched. Deuterium and Titanium worth $20 installed into the Power Station can maintain a housing area of 100 sq. meters for up to 1 year with no need for recharge or additional service. This is an unprecedented level of energy efficiency beyond what any of the existing sources may offer, including traditional nuclear energy. The energy of Deneum Power Station is yet eco-friendly, renewable and radically cheap. Deneum team has successfully concluded the first stage of the ICO private round having raised $ 1M. The funding will be re-invested into further R&D and Power Station G3 prototype development as well as deployment of Deneum own production line manufacturing the Power Station active body main components. Deneum team is planning to conclude the second stage of the private sale round by the end of September aiming at $ 2M hard cap. The total funding to be raised during all stages of the ICO is estimated at $ 90M. British manufacturer Rolls-Royce announced on its website , Monday, August 20, the launch of a lithium-ion electric battery for ships. The company has to deliver a battery system for the ships of the Norwegian company Hurtigruten. This is, in my opinion, what Rossi should be doing with its e-Cat instead of selling heat. Using steam engine, it would certainly be competitive with lithium batteries. “Rolls-Royce is launching a lithium-ion based energy storage system for ships. The gain for the ship owners is a clean, safe and cost-efficient complete system. Energy storage is a major green investment for a ship owner. Returns are maximised when the system is correctly dimensioned for the specific ship, and includes intelligent power control. Rolls-Royce have been delivering energy storage systems since 2010, however the actual energy storage units were previously supplied by an external party. Let’s look at the cause of LENR in action in the video above. This video shows the FUEL that the LENR developer has generated. That fuel is micro-diamonds implanted in a nickel substrate infused with deuterium. In general, all successful LENR fuels is based on the penetration of one of the hydrogen isotopes either protium or deuterium into the crystal structure of some solid material with a rigid lattice crystal structure. The list of materials that can support the generation of LENR fuel is palladium, diamond, titanium, and nickel. The function of these substrate materials is to compress the hydrogen isotope to a level sufficiently high enough to force the hydrogen to assume the super dense form. There is evidence that other elements and compounds can be compressed to such a high pressure by the substrate’s lattice that these various elements and compounds will compress into their ultra dense form. These elements and compounds include lithium and water, but ultra dense copper might have been generated in the proton 21 experiments. The compression force in the proton 21 experiment is provided by the shock wave of a high powered electrical discharge. These ultra dense molecules lay dormant inside the fuel until they are activated through the infusion of some form of photonic energy combination be it either heat, light… visible and/or ultraviolet, or RF. The ultra dense nano-particle that forms takes the form of a thin one dimensional nano wire with the protons of the hydrogen in the center of the wire and the electrons forming a cover(spin wave) around that center. This structure is produced by the superconductor property called the Meissner effect. This nanowire is a superconductor in which virtually no power is lost by its surface electron layers. The surface of the nanowire acts as an optical bottle in which light is captured and confined. The photons of the light combine with the electrons in the electron cloud around the outside of the superconducting nanowire to form a polariton condensate. This is a special type of plasmoid that does not lose power. This lack of power loss comes from the superconducting nature of the electrons on the surface of the nanowire. The polariton condensate is a fluid of light that holds onto light and does not let light escape. This plasmoid is a very special one in that it is a black hole for light: light goes in, but it cannot come out. This nanowire is what Ken Shoulders has called a black EVO. Getting into more detail, this ball of confined light is highly organized and is comprised of two independent currents (rings) of confined light separated into their photon’s handedness (chirality) forming two counter-rotating light currents: a right spinning current and a left handed spinning current of light. This soliton is sometimes called ball lighting. These counter rotating light currents produce magnetic rotating magnetic flux tubes that spin at the speed of light. These tubes are also called worm holes. One magnetic flux tube comes from the right handed spinning light current and the other from the left handed spinning light current. In summary so far, a black EVO is a black hole of light that produces a spinning magnetic flux tube ring shaped like a O. The experimental observation of this structure is explained in the referenced video of the LION reactor meltdown as seen above. This is what Bob Greenyer is seeing produce the double dot marks in the ash and experimental photographs of the LENR reactor meltdown. 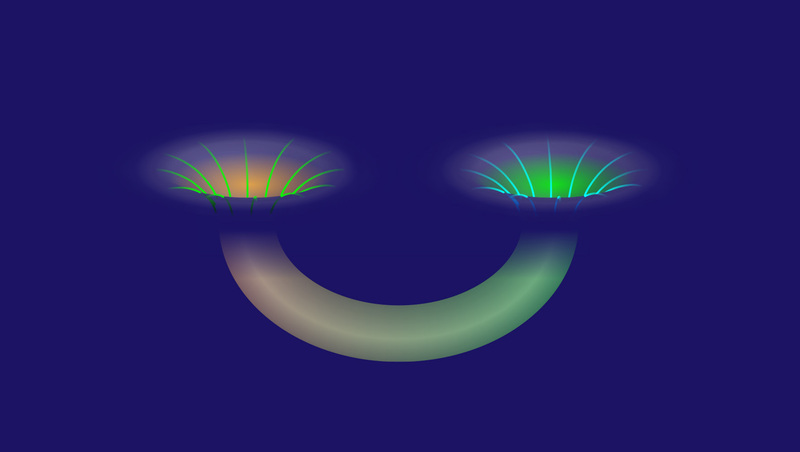 When a dipole black EVO is exposed to a high voltage spark, the index of refraction of the space time in which the light currents are circulating becomes imaginary and the two rotating light rings combine into a single ring. This disturbance in space time produces an EVO monopole. This EVO has only one flux tube, but that tube is a very powerful one, since it consolidates all the energy of the dipole flux tube system into a single consolidated monopole flux tube system. The dipole EVO usually moves around in a symmetrical fashion because its flux tubes are balanced and connected into a continuous magnetic ring. But when the monopole EVO moves, it hops around and leaves tracks like a rabbit since it has a single flux tube that whips around and causes the nanowire to hop in a random fashion. This is seen in the rabbit tracks that this monopole produces called strange radiation. Now that we know how the Black EVO is formed, how it moves, and what its structure is in detail, we can explain how it escapes the lattice of the substrate that formed it. In the upcoming posts we will see how the black EVO moves around inside that substrate and escapes from it. This explanation is offered in the next post with the aid of the referenced video as well as others as a record of MFMP experimental research. 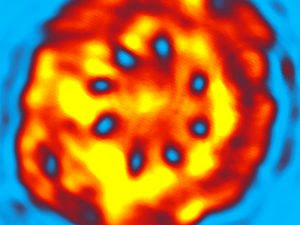 We will also see SEM micrographs of active LENR fuel and observe the tracks of the EVOs as the EVO exits the fuel and transmute matter as the EVO travels away from the fuel particles. 1. Do you have the factory in your possession where the production will take place? 2. Do you have the machinery (hardware and software) in your possession which will make the E-Cats? 3. Do you have the employees selected who can staff the initial production line? 4. Are you waiting for the results of the next round of SK testing before you start production? 5. Will you begin by manufacturing in the USA? He gives no details regarding the state of preparation for questions 1-3, but I don’t expect it will be greatly advanced if they are still undecided about whether to start production with the E-Cat SK or QX. Rossi has said in the past that they will be running tests in August and September to see if the SK is ready. I am still expecting that timelines could slip beyond January 2019. Even if the testing goes well and they find that the E-Cat SK reactor works very well, I think there could be many things that might prevent a production line getting up and running in a space of three months. They will need to be sure that everything is in very good order before they can start sending products out to work in the field. Thanks to Bob Greenyer for sharing about the following. Yesterday on the LENR Forum he has posted a recipe that he claims is “almost guaranteed to work”. 6. Get LiOD from Li + D2O reaction, 100mg Li in 5ml D2O. 7. Use stabilized DC power supply (Cathode -, Anode +) and power it, let it run at around 0.5W for over 3 days. 8. Get a paper and put it above the cell so that vapor is trapped by it. 9. Get Pancake GM detector (I think Russian detectors are the best and cheap) and measure radiation of the paper after 3 days. We can’t know if it’s the real thing unless someone tries to replicate it. So for replicators interested in testing out a recipe, here’s something to work with. Cold fusion fuel must be not only well heat sunk the reacting hot materials have to be dilute so that they don’t stay too cold, or get too hot, but make porridge that is just right . . . My present observations of coupling of the gamma and heat-producing reactions at a considerable distance make this process all the more mysterious. It is surely not neutron coupling. Some preliminary looking for anomalous magnetic effects offer hints but nothing on a grossly observable magnetic scale seems to be present. If there is a magnetic entanglement it is taking place via some here-to-fore unknown transfer medium. Does the magnetic force present itself as both a wave and particle? Alan Smith, who is working alongside Russ, and whose lab Russ is working in, has been posting some comments here, and on this thread on the LENR Forum, regarding their work, and answering questions from interested followers. It will be a magnificence as I can see it inside my brain. Pure Art of technology and a window with the view of the sun of the future. My life has been also a series of failures and errors and resiliency, but if all the enormous work for which I spent my life will have as a result this plant, my life will have been worth to be spent. Thank you for your kind wishes. Yes, an extremely important test will be made at the end of August through the first 10 days of September. After that, strategic decisions will have to be made. I think that this “extremely important test” involves determining whether the SK is fit for purpose. Rossi has said that he hopes it is, because it will mean far fewer reactors (and presumably controllers) will have to be built, and the overall dimensions of the plant will be much smaller, since far fewer reactors will need to be built. Today on the Journal of Nuclear Physics, Andrea Rossi revealed a pricing strategy for heat sold to customers from E-Cat plants. He was asked by Robert Dorr to clarify what the discount of E-Cat-produced heat for customers would be compared to the current fuel sources they are using. If our Customers now are spending 100, with the Ecat plants they will spend 80 and the price will be indexed with the variation of the market price, to maintain the 20% of earning for the Customer. 1. That it will always be 20 per cent less expensive than whatever the customer would normally use (e.g. natural gas)? 2. That if the price of (for example) natural gas rises, the cost of E-Cat heat will also rise? So it seems that Leonardo’s plan is to make sure that E-Cat-provided heat is always cheaper than alternative sources. From Rossi’s answer to my second question, it would appear that the indexing does follow price increases in competing fuels, just price decreases. Whether a 20 per cent discount will be attractive enough to entice customers to contract with Leonardo remains to be seen (assuming the plants work as described). Rossi Values 40 MW at $20 million. We know that Andrea Rossi’s plan is not to sell E-Cat plants to customers, but to retain ownership and sell heat. But here is a Q&A that gives us an idea of how he values his technology. Can you tell us the price of the 40 MW plant? The Client will pay nothing for the plant, because it will remain of our property and the Client will pay only the heat. Should it be for sale its price would be 20 million $, but for the time being we are not going to sell. That puts an industrial E-Cat plant at $500,000 per MW. We don’t know how much it will cost to build these plants, it will likely to be more expensive in the beginning until economies of scale are improved if he can get mass production off the ground. Since Rossi is not selling plants outright, and only selling heat once it is used, there will be a lot of upfront investment required for Leonardo. They will only be able to make money once the plants are up and running well, and customers are paying their bills.